In this current era of social media, a falsehood can circumnavigate the entire globe in a split-second, as was so shamefully underlined on Saturday night. In the 72nd minute of Napoli’s Serie A meeting with AC Milan at the San Paolo, Rossoneri striker Mario Balotelli was substituted. As the visitors’ star player, he unsurprisingly left the field to a cacophony of whistles and boos. Shortly after taking his seat on the bench, the Italy international broke down in tears. 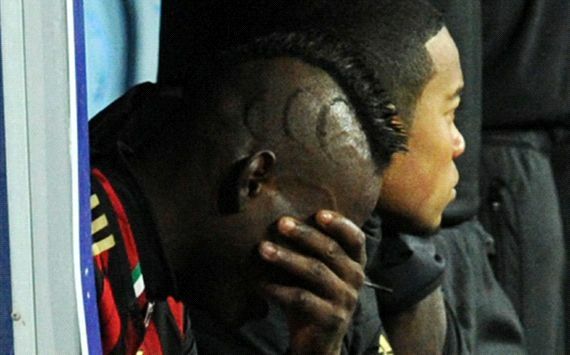 Balotelli could have been crying because of the boos. He could have been crying because his struggling side were losing – again. He could have been crying because he had squandered a decent opportunity to equalise shortly before being withdrawn. He could have been crying because he had been so desperate to score a goal in his first outing after learning via a DNA test that he was the biological father of Pia, the daughter of ex-girlfriend, Rafaella Fico. In all honesty, there could have been several reasons why this infamously enigmatic character had been reduced to tears. Nobody really knew for sure. Nobody knew the truth. Yet that did not stop many claiming that they did. Within seconds of Balotelli’s breakdown, Twitter and Facebook were awash with claims that the Palermo native born to Ghanaian immigrants had been reduced to tears by racist abuse from Napoli fans. In no time at all, a meme featuring a photo of a tearful Balotelli with the accompanying text “SAY NO TO RACISM!” was doing the rounds across social media. Pretty soon, well-known journalists were tweeting and retweeting as fact the ‘news’ that Balotelli had been racially abused by the Neapolitan crowd. Some English-language media outlets even ran with it. All of this in spite of the fact that Italian journalists present at the San Paolo were saying that no racial abuse had occurred. All of this in spite of the fact that Napoli fans, who have been repeatedly discriminated against by supporters of clubs from northern Italy, pride themselves on never resorting to such deplorable provocation. All of this in spite of the fact that Milan coach Clarence Seedorf stated immediately after the game that Balotelli’s emotions had merely got the better of him. All of this in spite of the fact that Balotelli’s brother subsequently pleaded for his sibling to be left alone after a “tough week”. But then, as Twain also pointed out, there are those that “never let facts get in the way of a good story” and, sadly, that too is as true today as it was a century ago. Anyone with even a basic knowledge of Italian football would have been sceptical about allegations of Napoli supporters engaging in racial abuse, let alone towards Balotelli. Indeed, on the morning of the game, the 23-year-old Azzurri forward had been mobbed by both Milan fans and local Neapolitans while taking a walk in the city with team-mate Adel Taarabt. That some journalists therefore elected to pass these wholly unverified reports on to their followers is both staggering and dreadfully irresponsible. That some huge media outlets then chose to publish stories on unsubstantiated claims is utterly shameful. Social media and the Internet certainly has many positives – helping eliminate censorship and providing a voice to the people. The world is a more transparent place as a result. But the Balotelli episode proves that there needs to be more accountability when offences are committed. It is not acceptable for Napoli and their supporters to be slanderously painted as racist. Of course, those guilty of such reckless journalism may claim that their hearts were in the right place; that they were merely trying to highlight what they thought was a disgraceful show of ignorance. But were they really? Or were they just cynically exploiting a story guaranteed to draw maximum attention for their respective publications? One could also argue that they were maybe just guilty of lazy journalism, in that they saw a black man whistled off an Italian football field and simply presumed it was racism because of the country’s poor track record in this area – even if such logic would make them as ignorant and stereotypical as those they were trying to castigate.